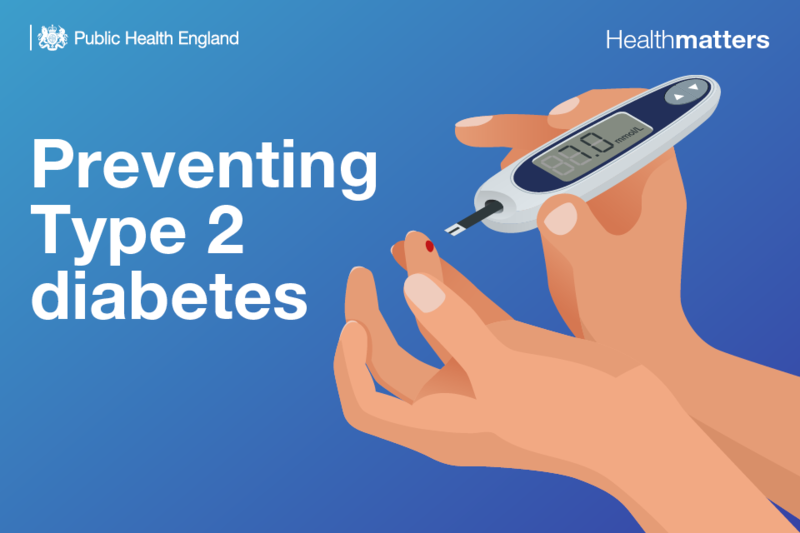 Welcome to the latest edition of Health Matters, a professional resource, which for this edition focuses on preventing Type 2 diabetes, focusing specifically on the role of the NHS Diabetes Prevention Programme (NHS DPP). In July this year the NHS will celebrate its 70th birthday. If we are to see another 70 years of the NHS then we need to use resources wisely and reduce the financial burden on the health service. Type 2 diabetes places a huge strain on the NHS accounting for just under 9% of the annual NHS budget at around £8.8 billion a year. Type 2 diabetes gives rise to a wide range of complications, including cardiovascular disease, blindness, kidney disease and failure, and diabetic foot disease and amputations. These complications account for 80% of the direct costs of Type 2 diabetes and result in 1 in 6 hospital beds being taken up by someone with Type 2 diabetes. Type 2 diabetes is now a bigger challenge than ever before thanks to the obesogenic environment in which people are exposed to unhealthy foods that are cheap and readily available from childhood. 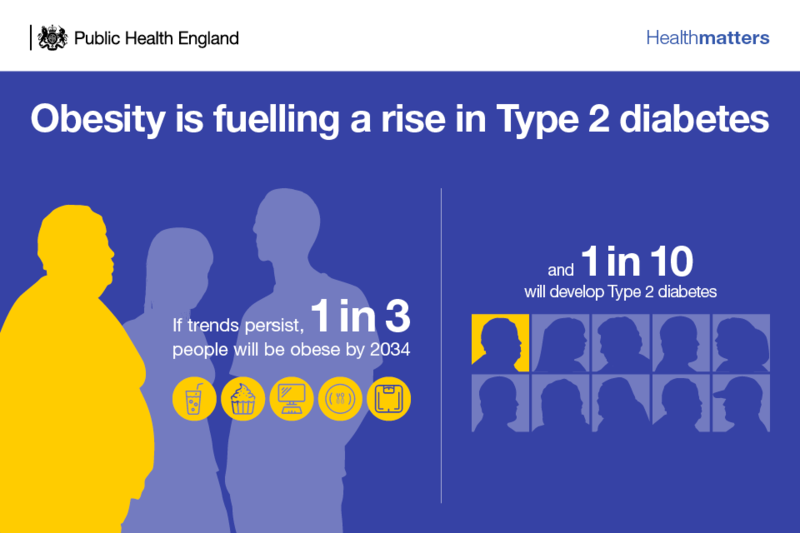 In England, there are currently 3.8 million people with Type 2 diabetes, with around 200,000 new diagnoses every year, and an additional 5 million people at high risk of developing it. 22,000 people die early every year in England as a result of the disease. Physical activity has decreased and more time is spent on screen-based and sedentary leisure activities. The unhealthy lifestyle choices we have increasingly been defaulting to all give rise to modifiable risk factors for Type 2 diabetes, which are primarily overweight and obesity (BMI of 25 or more) and a large waist circumference. 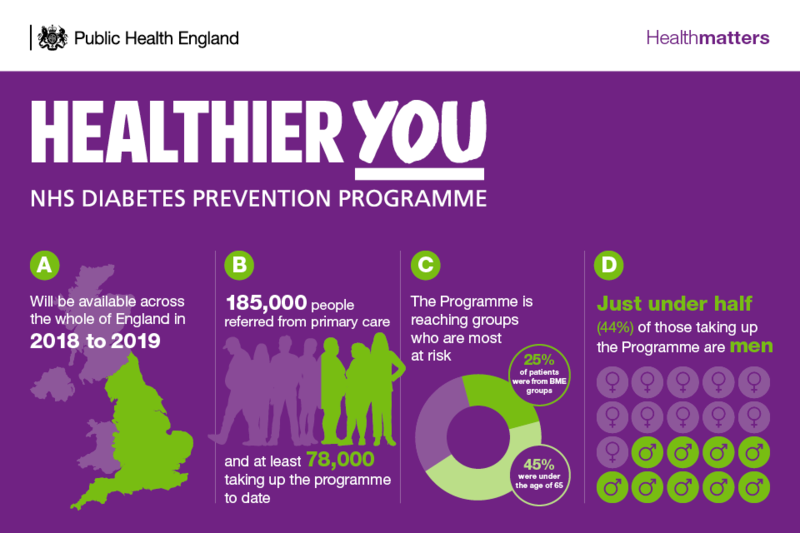 The national response to Type 2 diabetes prevention includes multiple behavioural interventions, which address the lifestyle choices that put an individual at high risk of developing the disease. This edition of Health Matters focuses on the NHS DPP – a joint commitment from PHE, NHS England and Diabetes UK. Launched in 2015, the Programme delivers evidence based behavioural interventions at scale for individuals identified as being at high risk of developing Type 2 diabetes. Individuals aged 18 years or over with nondiabetic hyperglycaemia (NDH) are eligible to join the programme, as they are at high risk for progression to Type 2 diabetes. NDH is defined as having an HbA1c of 42 to 47 mmol/l, or fasting plasma glucose (FPG) of 5.5 to 6.9 mmol/l. In June 2016, roll out of the NHS DPP began with a first wave covering 26 million people, half the population in England, and making up to 20,000 places available. In April 2017, the programme mobilised across a further 13 sustainability and transformation partnerships, achieving 75% population coverage in England. The programme rolled out to all remaining CCGs and local authorities in England that were not previously included in the programme, achieving full coverage from April 2018. Referrals from the remaining areas will start in July 2018. There have been over 185,000 referrals and over 78,000 taking up the programme to date. Early outcome data suggest that over 50% of the individuals that started the intervention completed it, with an average weight loss of 3.3kg and 3.37kg for obese and overweight patients. A digital pilot of the NHS DPP was launched in November 2017 and referrals to digital services commenced the following month in 8 digital pilot sites. 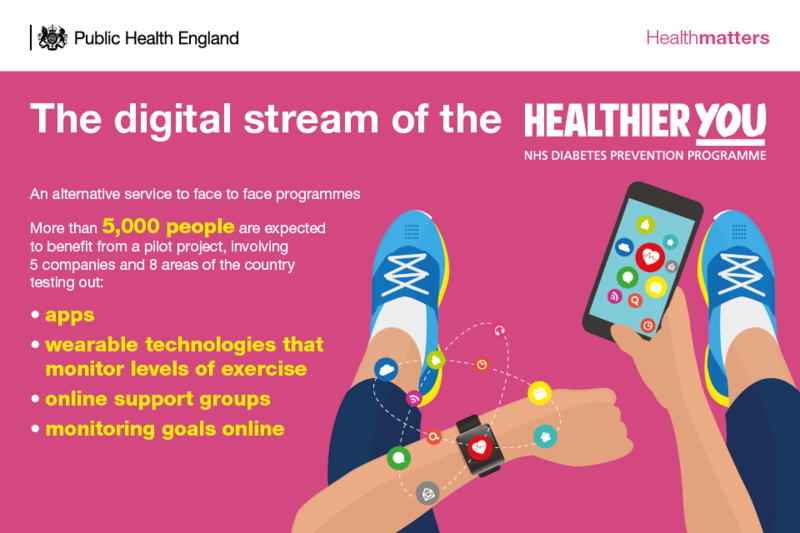 The digital stream offers an alternative service to face-to-face programmes, with the potential to widen access to diabetes prevention. It is important to have a smooth referral pathway that works hand in hand with the NHS DPP providers. To achieve this, the number of GP referrals must be realistic so that demand matches the providers’ supply capacity. This, in turn, can minimise waiting times and therefore drop out from the programmes. Read this edition of Health Matters to find out what primary care professionals and local authorities can do to enable a successful referral process, and maximise the number of individuals identified as being at risk of Type 2 diabetes taking up and completing the NHS DPP. This material avoids the issue of dietary advice and the Eatwell plate. The science is now clear that people at risk of T2D should not be eating carbohydrates. Results from low carb and keto diets show greater weight loss, better ability to maintain a healthy lifestyle, greater reduction in blood glucose and better control of blood glucose. Your programme is out of date. I couldn't agree more with Aidan. We are shortly launching the Diabetes Virtual School which will promote a low carb, blood sugar diet which is PROVEN to reverse diabetes. Happy for this online school to be added to the list of interventions you are piloting across the UK - please get in touch. Continuing to push the Eatwell plate and high carbohydrate dietary principles demonstrates unnecessary and rigid adherence to outdated and potentially deleterious advice. This in the face of mounting and published, peer reviewed evidence that this continued espousing of received wisdom is, in part, a significant contributor to the problem in the first place. Oh and everything that Aidan said above. Dr. Levy and his committee of experts have reviewed ALL the relevant studies in the field. They only looked at large evidenced based reliable studies.To the best of their knowledge the Eatwell Plan reflects the best possible application of nutritional knowledge to date.Tremendous achievement. To be applauded- and followed. In spite of the opinions expressed here, people who follow this plan will be protected against diabetes.